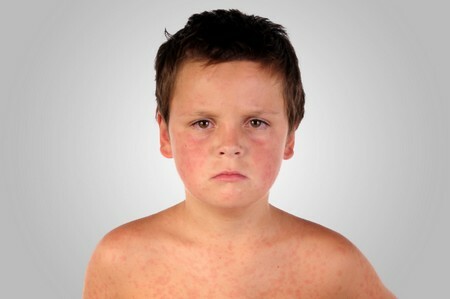 Measles is a common and highly contagious viral disease. It is spread by airborne nasal secretions. 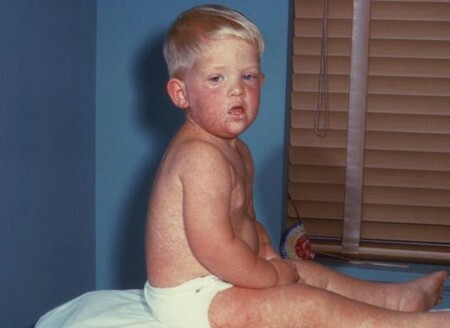 Symptoms include runny nose, sore eyes, dry cough, raised temperature, headaches, small white spots in the mouth and, after a few days, a brown-red rash will start to cover the upper body. The lymph glands may also become enlarged. It may take an incubation period of eight to ten days for these symptoms to appear and the child will then be contagious from the start of this time to a week after the onset. Lesser complications such as chest or ear infections may develop. In children under five, there is also the slight possibility of febrile convulsions, when the child loses consciousness and the limbs twitch uncontrollably for a short time. More serious complications include encephalitis or inflammation of the brain. The MMR (measles/mumps/rubella) vaccine is routinely given to children aged about fifteen months. Although the number of cases of measles has been reduced, many children who now catch measles have already had the vaccine. Once diagnosis has been confirmed, make sure the child drinks plenty of fluids. Try to keep their temperature down by sponging with tepid water. Their eyes may also be sore and bathing them in warm water or eye drops may help. Look out for complications such as ear ache. Although little can be done about the appear­ance of spots, the other symptoms may be helped. Gelsemium may be prescribed by a homoeopath to help reduce the raised temperature and headache, as well as possible associations such as thirst and constipation. Euphrasia will help the runny nose and sore eyes. If the child is feeling very restless and irri­table due to their illness, Pulsatilla may work as well as help­ing to clear the cough and catarrh from the nose and throat. A herbalist may recommend a general increase in vitamin C to help fight off infection. A mixture of herbs, such as Golden Seal to help reduce runny nose and sore eyes, Chamomile to calm the child, Echinacea to deal with the infection, and Marigold if the glands are swollen, may be prescribed. A practitioner may advise infu­sions or decoctions to help reduce what they see as heat in the blood and stomach. These may include Safflower, Pepper­mint, Marigold and Yarrow. A cooling solution of Lavender may be applied to the spots. A naturopath will recommend boosting the immune system to help fight off infection, so an increase in foods containing vitamins A, C and E and also zinc, which can be found in fruit and vegetables, will be recommended. Mineral salt supplements, such as iron, magnesium and potassium phosphates and potassium chloride may also be given. However, at first your child will probably not want to eat much food, although drinking water should be encouraged. Foods that encourage the production of mucus should be cut back, such as dairy products. If the child is suffering from itching, a tepid bath containing oatmeal should help bring relief. Herbal remedies, such as Yarrow, Chamomile, Skull­cap, Cleavers and Golden Seal may also be given. If your child’s temperature is over 40°C (104°F), their breathing is shallow, they have chest pain or lose conscious­ness, seek medical help immediately. Other therapies that may be beneficial: reflexology, aromather­apy, Bach Flower Remedies, biochemic tissue salts.